Time to lynch another black Chicago City Employee? The Office of the Inspector General published it has busted another Chicago Department of Water Management employee with an alleged residency violation in their last report. 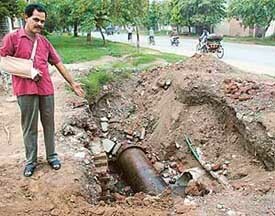 The Department of Water Management put this employee on paid leave April 25, 2011. That very day, arrangements were quickly made with Plumber’s Local 130 to have a meeting at 333 South State Street to decide this Plumber’s fate. Since this Plumber is late on his dues, this guy got the royal treatment. He had a meeting the very next day. The Office of the Inspector General has also investigated other members of Local 130 for alleged residency violations that are currently under review. 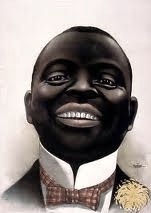 It sure stinks to be a black man in the City of Chicago. I hope these guys get a lawyer like Rahm Emanuel so they can live anywhere they please. So far no progress is made on the scam promotions, investigations and claims made to the Shakman Monitor. Time for Rahm to put David Hoffman back as Inspector General as soon as he can. Photo by white racists. < ! 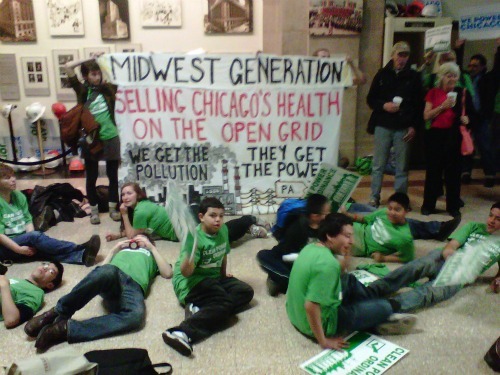 [CDATA[ A couple of hundred protesters were fighting for clean air at Chicago City Hall today. Many folks that read Chicago Clout understand I have brought this issue to the press for years. I have posted many pictures of the coal fired power plants located in the Chicago Southside. I was hoping Mr. Del Valle would become Mayor of Chicago and have a real friend on this issue. I want you folks to understand, the Daley family and the rich powerful interests control the air pollutions. The Daley family is on corporate boards that can clean the air. I consider the positions so companies can legally bride positions. I want all you parents with their kids squirming on those dirty non-union maintained floors on the second floor of city hall, nothing will be done except some lip service. The air in Chicago will only get better when you vote new folks into office, one trick pony Harry Osterman was a no-show. I am happy folks are involved in making the world a better place, better you better make changes, and throw the bums out! Chicago Clean Power Ordinance is a start. Keep up the good work Alderman Moore of the 50Th Ward. Picture taken by Patrick McDonough. The first of several complaints many years ago never made it through the heads of Mayor Daley’s employees. Many Chicago Department of Water Management employees received their promotions thanks to politics. This tradition continues despite than many complaints from non-clouted workers. Several of the foremen were reminded to place the shoring in the ditches to save lives. Chicago Whistleblower Patrick McDonough was made aware some crews on the Southside were caught again with-out the shoring. The Illinois Department of Labor is in charge of enforcement at the Department. I do not know why the Water Department does not enforce this common sense safety rule. I suggest privatizing all pipe work and firing the every foreman and their superiors in the Department. Rahm Emanuel might start to enforce the rules and save lives. Chicago Clout will start to videotape again until safety rules are back in place. Remember, if your boss asks you to work in a ditch with no shoring, call the commissioner. Save your job. Several City of Chicago Department of Water Management employees will undergo grilling for alleged complaints from showing up late to work to sleeping on the job on April 20, 2011 at 1424 West Pershing Road. Some of the employees said the Water Department looks away from complaints made against employees working for Rahm Emanuel and the Chicago Democratic machine. One employee stealing money and submitting false expense reports was not disciplined at all. One employee with a no-show do nothing job is untouchable said a high ranking insider. The non-political workers will be an example of the Department of Water Management attempting to show Rahm Emanuel their jobs are needed. "I think we need to remove all of Mayor Daley&apos;s do nothing hacks that have kept the Water Department in the Newspapers for the last decade", a Rahm insider leaked out today. 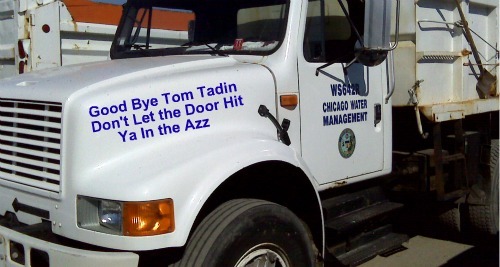 Chicago Clout gave a list of Water Department management employees involved with the Hired Truck Scandals to the contractor scams that have destroyed the department to the transition teams. Chicago Clout also gave the names of management that earns their money. We need to clean up the dirty water in Chicago. The only reason Rahm Emanuel is Mayor of Chicago is the Chicago Plumber&apos;s Union. Look at this picture very close. Just before Rahm Emanuel was made Mayor of Chicago, he looked into the face of arguably the most handsome plumber in America. If you look closely at this picture, you can see Tom McManus, a Local 130 goon, pulled Rahm Emanuel’s hand down to humble this guy and let him know who the real boss of Chicago is. Rahm Emanuel seems a little upset that this heifer has the balls to manhandle a former Obama Chief of Staff of the firkin United States of America. Rahm might have you thinking he is the Mayor of Chicago, but he is a pawn of the most political union in the country. Many folks in Chicago know if you want to become an elected Judge, get on the ballot, and win a judgeship, you better start snooping around the Plumber’s Union. Some folks say the fix is in and having a brilliant career in law is just not enough, they are correct. If you want to become a judge in Chicago, you will need to fork over tens of thousands of dollars for the ballot access and then for the ward bosses to make sure your name is on the palm cards. Judges are commodities, sold to the highest bidder. You need not look closer than Rahm Emanuel’s fraudulent residency to know who runs Chicago, it ain’t Rahm folks, and it ain’t Rahm. The Judges are just a bunch of pawns also, just doing as ordered. Welcome to Chicago Rahm, stand in line tough guy and do what you’re told. I know who runs Chicago and so do you. 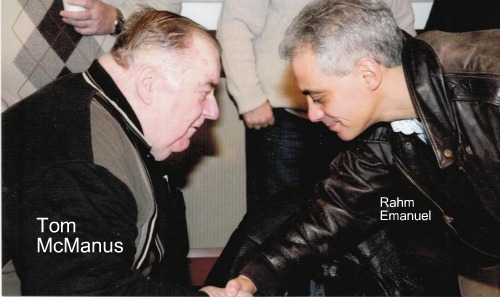 Photo of Tom McManus and Rahm Emanuel.